Swagbuck Extravaganza 80 Swagbucks for New Members! You all know how much I love Swagbucks. If you haven’t signed up yet, today is the day to do so. Swagbucks is have a Swagbuck Extravaganza today giving out 40 Swagbucks throughout the day. If you are new to Swagbucks, you’ll get 80 Swagbucks just for signing up! Head over to Swagbucks and sign up! Use code MEMORIALDAY to get started. Remember all the giveaways I did around the holidays? I used Swagbucks to get those awesome Amazon.com gift cards! Now they’ve added even more options. I can’t wait to see what we’ll be giving away this year! Offers May 26, 2011 in free, SwagBucks · Expired! I am so happy it’s Friday. I’m really ready for a fun weekend ahead. Since it is Friday, that means it’s Mega SwagbucksDay. If you haven’t heard about Swagbucks, it’s a search engine similar to Google. The difference, you earn reward points when using the Swagbucks.com search box. Friday is the day to really start searching because it’s “Mega Swagbucks Day” and you can earn high value Swagbucks. It’s free and really easy to start earning rather quickly. You can cash in your Swagbucks for gift cards from Starbucks, Amazon, Target, CVS and more!! Just 450 Swagbucks will get you $5 to Amazon.com! Are you earning Swagbucks? Remember my â€œHoliday Challenge,â€ I’ve already have enough for several gift cards! How many Swagbucks do you have? Head over to Swagbucks and sign up! It’s free and easy to earn great rewards. TGIF! It’s Friday, which means it’s Mega SwagbucksDay. Have you signed up for Swagbucks yet? Swagbucks is a search engine similar to Google. The difference, you earn â€œSwagbucksâ€ when using the Swagbucks.com search box. Friday is the day to really start searching. You can earn high value Swagbucks today. You can cash in your Swagbucks for gift cards from Starbucks, Amazon, Target, and more!! Just 450 Swagbucks will get you $5 to Amazon.com! Head over to Swagbucks.com and sign up! It’s free and easy to earn great rewards. Offers Apr 29, 2011 in SwagBucks · Expired! It’s Friday! Mega Swagbucks Day! TGIF! It’s Friday, which means it’s Mega Swagbucks Day. Have you signed up for Swagbucks yet? Swagbucks is a search engine similar to Google. The difference, you earn “Swagbucks” when using the Swagbucks.com search box. Are you earning Swagbucks? Remember my “Holiday Challenge,” I’ve already got enough for 9 gift cards! How many Swagbucks do you have? TGIF! It’s Friday, which means it’s Mega Swagbucks Day. Have you signed up for Swagbucks yet? Swagbucks is a search engine similar to Google. The difference, you earn “Swagbucks” when using the Swagbucks.com search box. Friday is the day to really start searching. You can earn high value “Swagbucks” today. You can cash in your “swagbucks” for gift cards from Starbucks, Amazon, Target, and more!! Just 450 Swagbucks will get you $5 to Amazon! Are you earning Swagbucks? Remember my “holiday challenge?” I’ve already got enough for 8 gift cards! How many Swagbucks do you have? Offers Apr 1, 2011 in SwagBucks · Expired! Swagbucks turns 3 today! To celebrate, they will be giving away a ton of Swagbucks throughout the day. Plus, if you sign up today they will give you 80 FREE Swagbucks! 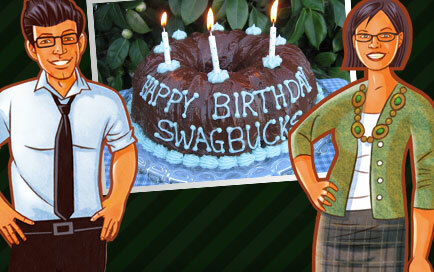 Enter this code: 3rdBirthday158 (case sensitive) to get 50 additional swagbucks. Code is good through 2/28. Remember, it only takes 450 pts. to get a $5 Amazon.com gift card! Are you earning Swagbucks? Remember my “holiday challenge?” I’ve already got enough for 5 gift cards! How many Swagbucks do you have? It’s Friday, which means it’s Mega Swagbucks Day. Have you signed up for Swagbucks yet? Swagbucks is a search engine similar to Google. The difference, you earn “Swagbucks” when using the Swagbucks.com search box. It’s Friday, Mega Swagbucks Day! Friday is the day to really start searching. You can earn high value “Swagbucks” today. You can cash in your “swagbucks” for gift cards from Starbucks, Amazon, Target, and more!! Just 450 Swagbucks will get you $5 to Amazon! Are you earning Swagbucks? Remember my “holiday challenge?” How many Swagbucks do you have? I love Fridays! Every Friday is Mega Swagbucks Day. Have you signed up for Swagbucks yet? Swagbucks is a search engine similar to Google. The difference, you earn “Swagbucks” when using the Swagbucks.com search box. Friday is Mega Swagbucks Day, which means you can earn high value Swagbucks just for using their search box. You can cash in your “swagbucks” for gift cards from Starbucks, Amazon, Target, and more!! Just 450 Swagbucks will get you $5 to Amazon! Sign up for Swagbucks today and start earning!